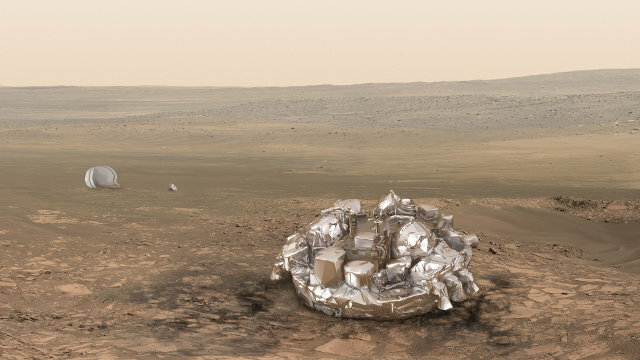 The ESA and Roscosmos’ TGO (Trace Gas Orbiter) space probe and the lander Schiaparelli have reached Mars completing the first phase of the first mission within the ExoMars program, started with their launch on March 14, 2016. Schiaparelli had separated from the TGO on October 16 with some thrill because the maneuver was successful but its telemetry data arrived with considerable delay. For about three Earth days, TGO and Schiaparelli traveled on trajectories that have gradually diverged. The TGO started the maneuvers needed to enter Mars’ orbit while Schiaparelli started the maneuvers required to get in a ballistic trajectory to land on the red planet in the area called Meridiani Planum. The two spacraft completed their maneuvers almost simultaneously, the TGO entering Mars orbit and Schiaparelli landing on the planet. ESA and Roscosmos have already sent space probes to Mars, ESA was looking for its first success in putting a lander on the planet’s surface and that’s the reason why it was decided to make a first attempt with Schiaparelli and then to develop the technologies to use for next mission in the ExoMars program. For the TGO the series of maneuvers was quite normal for an orbiter although many things can go wrong. For Schiaparelli it was about testing the technologies developed for this mission with a heat shield that protected it from friction, a parachute and a propulsion system to slow its descent. A structure especially produced was meant to cushion its impact with the Martian soil. Since Schiaparelli was constructed to test landing technologies and for this reason it’s also called the Entry, Descent and Landing Demonstrator Module (EDM), it wasn’t equipped with long-term powering systems but only with batteries. This means that it can only work for a few days but it was still equipped with some instruments to detect environmental data in the area. On the contrary, the mission of the TGO is long-term with a long series of adjustment maneuvers of its orbit. With its instruments, it will try to detect the presence of gases such as methane in Mars atmosphere and of any changes in its concentration. Methane can be produced by biological activities but also in other ways so it’s important to monitor through a long period. The TGO will also be used as a radio relay the ExoMars program. The second mission was officially postponed to 2020 and will consist in sending a rover to Mars that will continue the search for possible life form, past or present, on the surface but also underground through a drill that will allow it to take samples to analyze. For now, ESA and Roscosmos know that the TGO entered Mars orbit and are checking its characteristics. 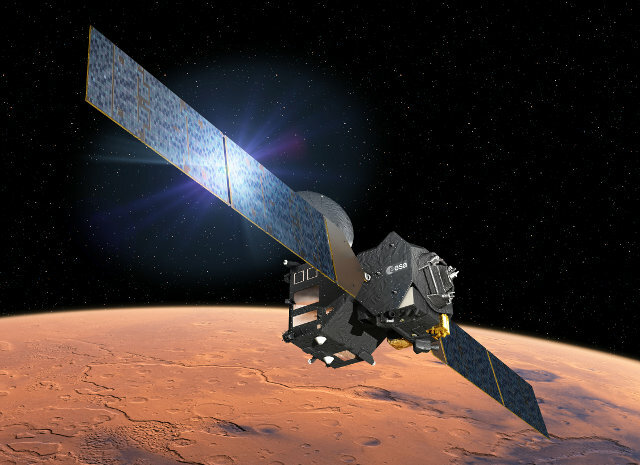 Also thanks to the use of Mars Express, the other ESA’s Martian space probe, some data from Schiaparelli were received but its precise state is yet to be verified.